Let’s face it: a well-planned wedding is a happy wedding. Investing the time and, yes, the money to work with a skilled wedding planner, pays off in spades. As grooms, you get to focus on each other and the joy of your momentous day, without worrying whether the peonies are at peak bloom. 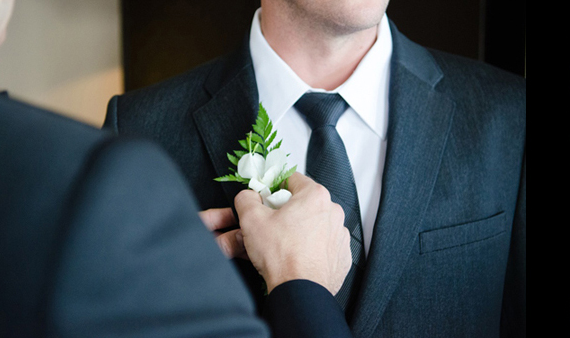 As guests, you get to experience the joy of the grooms and the ease of a seamless event. There are skilled wedding planners and there are expert ones. Then, there is Jason Mitchell who is in a league of his own. Jason is the author of Getting Groomed: The Ultimate Wedding Planner for Gay Grooms, a superb gay wedding planning guide. Getting Groomed not only provides the most effective planning pointers, but also asks the most insightful questions to help grooms focus on what really matters to them about and for their wedding. Getting Groomed is expertly written, not to mention is encyclopedic in its lyric and movie references, making for a very fun read. Jason’s event and wedding planning experience runs chic and deep having worked for Soho House New York for many years, and now with Shiraz Events, overseeing their wedding market in both New York and Los Angeles. There, Jason is charged with planning weddings that are the stuff of legend. And, with this interview, Jason also joins Men’s Vows as our first expert contributor. We are fortunate to include him in our community and share his wisdom with all of you. MV: Storytelling is a consistent theme in Getting Groomed - a philosophy almost! Tell us more about storytelling and its importance to a wedding. JM: A great wedding tells a couple’s story: how they met, what drew them to each other as husbands and a glimpse into their future. How they tell the story is in the very conscious choices the grooms make about why they are marrying, the reason for the venue, the choice of cocktails and menu, the first dance, the very words they hear when they are proclaimed as married. 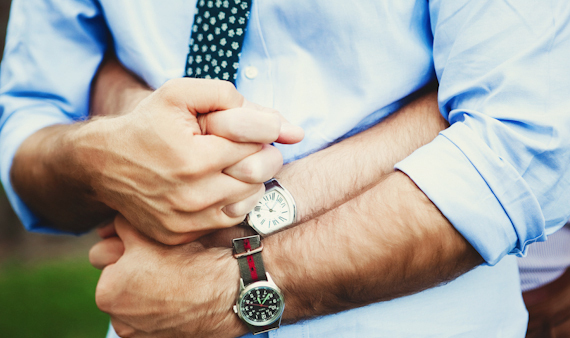 Every choice two grooms get to make is an opportunity to share an aspect of who they are as individuals and, as of the wedding, as a couple. A wedding story can be funny, classic, unexpected, quirky, epic or just a quiet affair. Most importantly, it must be authentic. There is no right or wrong here. What is beautiful to one couple might be completely unappealing to another. If you're a couple who has decided to marry, then you have a love story worth telling. I really enjoy it when couples embrace their sense of humor - weddings are happy occasions and don't have to be all tears and tissues. 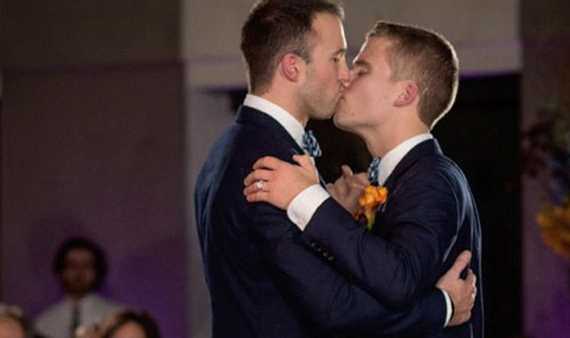 Who doesn't want to have a laugh as a newly married gay couple recesses to Madonna’s: Like a Virgin! I feel I have succeeded if I’ve helped a couple embrace the uniqueness of their story and translated it into an experience in which everyone feels included. MV: We found your questionnaire for helping grooms outline their vows really effective. Why did you develop this tool? JM: Not everyone is good at expressing feelings. But, when grooms decide to not write their vows, for whatever reason, I feel they are missing a huge opportunity. At the end of the day, vows are what matter most at a wedding. So, I wrote the questionnaire in the book to encourage guys to explore both the serious and the silly and help them really own their vows. They don’t have to be overstated and they can be the traditional vows we’ve heard many times over. But, make sure you are really, really connected to them. We all want to hear you express to your husband-to-be why you are marrying him and how you intend to be towards each other. Authenticity is paramount here. I remember one of the couples whose wedding I did – grand and huge – a lot of it a celebration of recent financial success. However, one groom expressed that even if they never left their first shoebox apartment, never experienced their success, he would be OK because they would always have each other’s souls. JM: My number one must have for any event is structure and flow. I really focus my grooms on what experience they are giving themselves and their guests and to think about it from beginning to end. I want grooms to give each important moment its due and not lump everything together. Grooms should think of their wedding as theater, without a NYT review at curtain time! But, this theater should include a script, with workshops and rehearsals, a well-coordinated crew of vendors and, yes, like live theater, spontaneity, too. And, as much as I wrote Getting Groomed to help grooms plan and deliver their wedding on their own, I really believe they should have a planner or, carrying on with the theater metaphor, at a bare minimum a stage manager on the day. Another one of my must haves is to have a vision that is do-able. Everyone has different financial means, and being realistic for what you can achieve in your budget is important. Ideally you are very comfortable with how your means align with your vision for your wedding, and you've selected a venue accordingly. It's one thing to book a blank canvas with the intention of transforming it. It's another to fight the space. You know, why book a castle to then turn it into a gallery? And, lighting!! Lighting is my magic bullet for any and all events as it is an incredibly efficient way to create ambiance, change the mood, mask the particularities of a venue and even turn your good pictures into amazing ones! It can be proper theater lighting or it can be hundreds of candles. Either way, you enhance your incredibly memorable story with the right lighting. While not exactly a “don’t bother,” I think that with the proper lighting and in the right venue, you can almost forego or really minimize florals. I am amazed by how many straight brides regret the amount of effort and money they invest in flowers. Once you have a properly-styled table filled with flatware, linens, candles, not to mention an incredible venue filled with loved ones, there’s little need for over-the-top flowers. Yes, add an element of nature, but focus on creating impact through your story. Remember that often less is more. MV: What are the latest trends you’re seeing in weddings? JM: One big trend is how couples are rearranging the order of the wedding day, starting with a cocktail hour then into the ceremony and reception following. This makes for a more relaxed and integrated experience, and takes away a lot of the anxiety that grooms and guests feel waiting for the ceremony to begin. It also eliminates common issues of guest being late to the ceremony. In a similar manner, cocktail receptions are replacing formal seated dinners. Passed hors d'oeuvres and multiple food stations paired with guest areas conducive to both seated and standing dining make for a more causal and unusual reception, and it eliminates the often daunting task of seating arrangements. Obviously trends in social media are trends in weddings. Video booths are replacing photo booths. Hashtags went from being a trend to a "must have" as an important way for people to share their experience of the wedding. However, grooms are getting stricter with social media during the ceremony. It is common now to ask guests to be fully present at the ceremony by asking for all phones to be put away. All of the professional photos will be made available to guests, because grooms would much rather look out and see the faces of their friends and family rather than a sea of smartphones. MV: Much has changed since you published your book and all your advice still rings very true. That said, were you to issue an updated version, what would you focus on changing? JM: I would probably elaborate more on suggestions for structuring the ceremony from the ways to stage the processional to all of the content. I have found these details are often less important to grooms than the party. But, when I have supported grooms in really focusing on the ceremony, they are really grateful that we did. MV: What do you think straight couples have to learn from gay couples when it comes to wedding planning? JM: I have already seen a shift. Gay weddings focus on the couple. There isn’t a disproportionate focus on just one person. So, straight grooms are now getting more involved in the planning. Some straight couples are foregoing the “first look” and spending the day enjoying the pre-wedding preparations together. And, they are getting equally inspired about evaluating old-fashioned etiquette and traditions and making them their own. MV: What do you enjoy about wedding planning? JM: I do what I do because I have the ability to give something to people that means something to them. My work becomes part of one of their most important memories. No two weddings are ever alike, so as a planner I learn something new from each event. And, best of all, I am a part of the shift where gay weddings are going from niche to being mainstream. Learn more about Getting Groomed and Jason here.